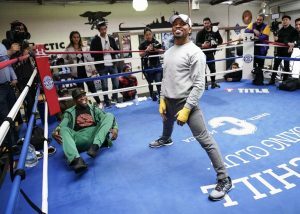 The consensus around boxing circles is that the Welterweight division is among the most talented and deepest in the entire sport. It’s not hard to see why. Not only is that weight class filled with numerous contenders but the current belt holders all have a reasonable claim in thinking they are the very best. WBO and IBF champions Terence Crawford and Errol Spence Jr have big matches coming up. Former belt holder Danny Garcia has his own date with Adrian Granados arriving shortly. Keith Thurman and Manny Pacquiao delivered big time in their most recent ring returns as well. When mentioning the very best in the division Porter’s name is seldom brought up. Why is that? He is after all a two time champion. Let’s also not forget that he gave Thurman his toughest challenge to date. He also unseated Garcia in their battle for the vacant WBC crown. Still even with those accomplishments he does not get as much attention as the previously mentioned fighters. Porter doesn’t have the most aesthetically pleasing style in the ring, often times just charging in and muddying up the fight. It isn’t always fun to watch but it does get the job. Even with a belt wrapped around his waist it feels as though Porter is the forgotten man. He is frequently discussed in such a fashion that would seem as though he and his title are easy pickings. His matchup against Ugas is one that most have tabbed him to win, but their wouldn’t be much shock if Ugas was able to dethrone him now would there be? Sure Ugas is a very skilled and tough fighter but how would his chances be perceived if he fought any of the other champions? Not very high to be frank. So why is he given at least a solid shot against Porter? Maybe it is because Porter is the weak link? Believe that statement if you want but be prepared to be sadly mistaken. Porter’s game might be a bit unorthodox but it is effective nonetheless. As already mentioned, many of the top Welterweights have already recently fought or will be fighting in close proximity. Before Spence, Crawford and Garcia all get their moments to shine Porter will have the stage to himself. He will be aiming to make an emphatic statement at the expense of Ugas. Now is his moment to make his claim that he is in fact the best that the division has to offer. On March 9th all eyes will be on Shawn Porter.